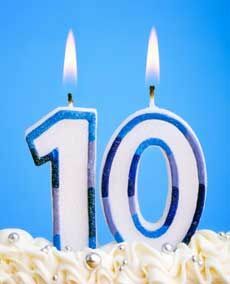 10 years ago today, I published my first blog post. I had no clue what I was doing - clearly that's obvious from my blog's name. I knew that I had something to say, I wasn't quite sure how or where to say it. Blogger looked easy enough - like a glorified word file - so I went with it. I had no freaking idea how much I needed my community - until I found it. (whatever and whomever the heck you believe in) that I did! These past 10 years the DOC has given me love; laughter, support, knowledge and a fantastical D Tribe that has been there through all my HIGHS and the LOWS.... and not just re: my life with diabetes. Over the past decade, you guys have been there for all the highs and lows of my life! Cheering me on.... and picking me up whenever I fell. Blogging about and advocating for diabetes has changed my life; reinforced that I am not alone, altered my career path, and taught me that my greatest perceived weakness ( my busted pancreas,) is actuality my greatest strength and biggest passion. I learn and continue to learn from every person with diabetes - or who has a loved one with diabetes. I�ve made friends around the globe - some I�ve been lucky enough to meet in real life! AND I AM ONE LUCKY DUCK. My community taught me to speak up and speak out - that my voice mattered - that all of our voices matter. The DOC taught me that people with diabetes - and no matter the type, are in this together. There is no "separate but equal," when it comes to diabetes types - or anything else. And the Diabetes Online Community has proven to me time and again, that alone we trudge up hills, together we move mountains. Guys, thanks from the bottom of my busted pancreas for always being here for me! Now, back to moving mountains!